1.1 Northeast Monsoon conditions prevailed over the northern ASEAN region in the first half of November 2018. In most parts of the Mekong sub-region and the northern Philippines, conditions were drier with a decrease in shower activities as compared to the previous fortnight. 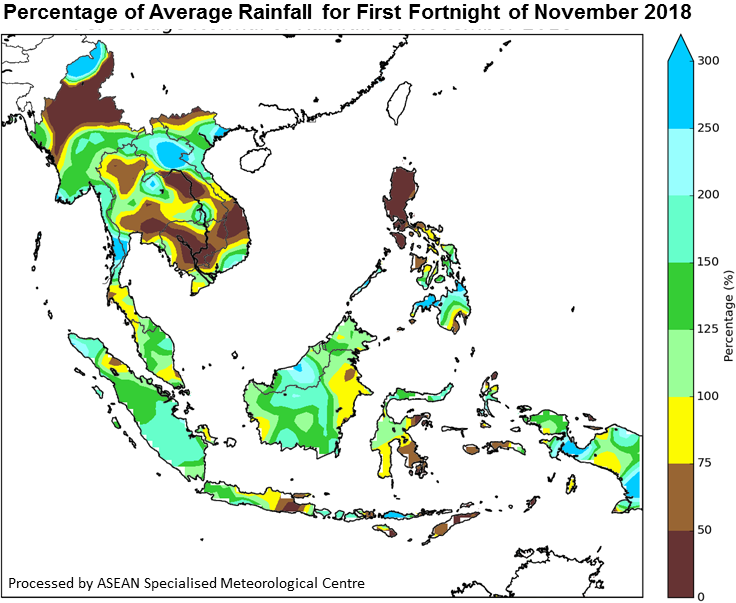 Below-average rainfall was also received in many parts of the northern ASEAN region. 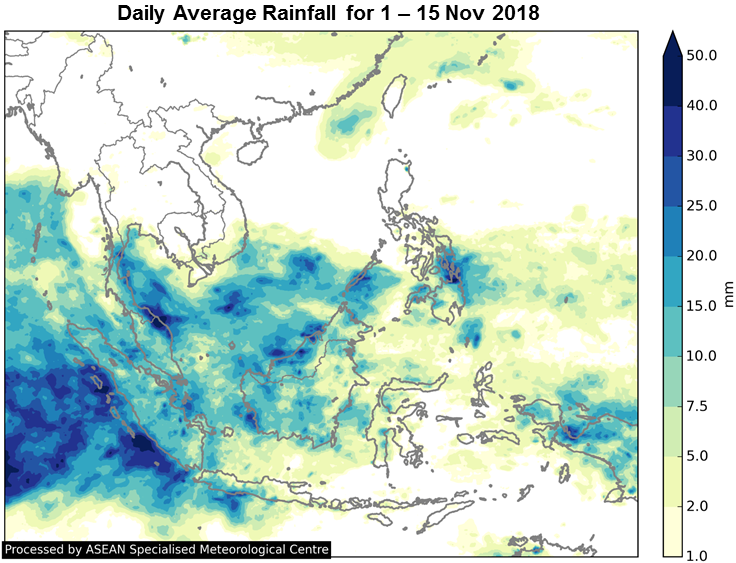 In contrast, there were wetter-than-average conditions over many parts of the southern ASEAN region as a result of the Madden – Julian Oscillation (MJO) and wind convergence. 1.2 The daily average rainfall and the percentage of average rainfall for the first fortnight of November 2018 are shown in Figure 1 and Figure 2 respectively. 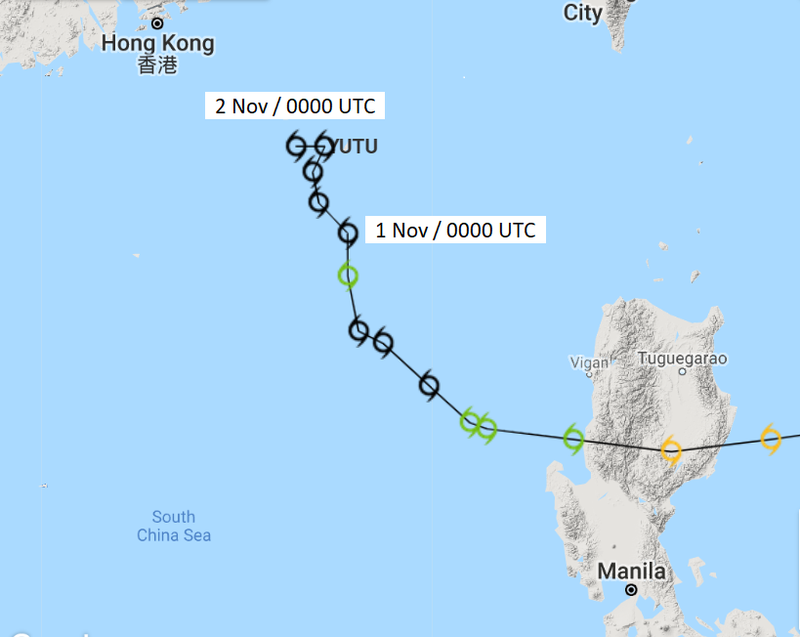 1.3 Tropical Storm Yutu, traversed across the Philippines in October 2018 and track northwestwards before it weakened into a low pressure system over the South China Sea in early November 2018. 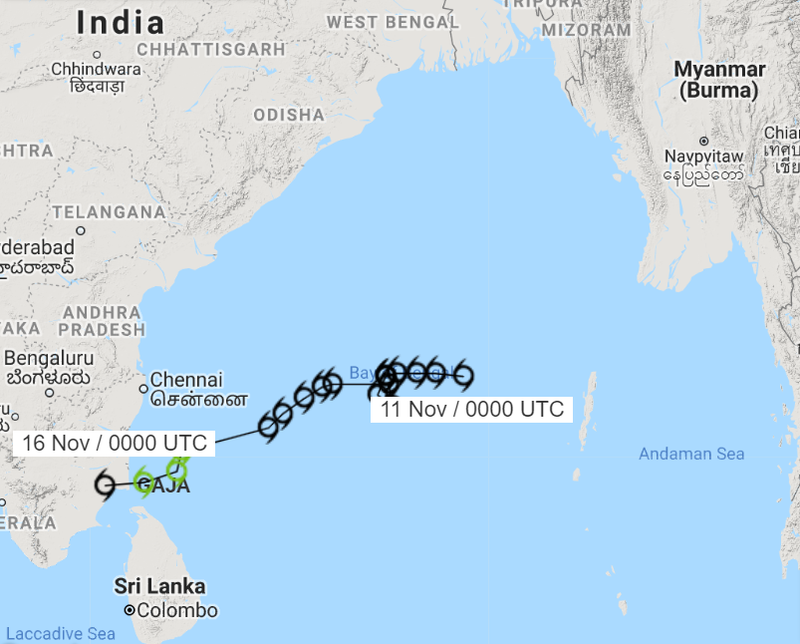 In the second week of the fortnight, Tropical Cyclone Gaja developed over the Bay of Bengal and subsequently tracked westwards away from the ASEAN region. The presence of Tropical Storm Yutu and Tropical Cyclone Gaja in the region during the fortnight influenced the winds in the region. 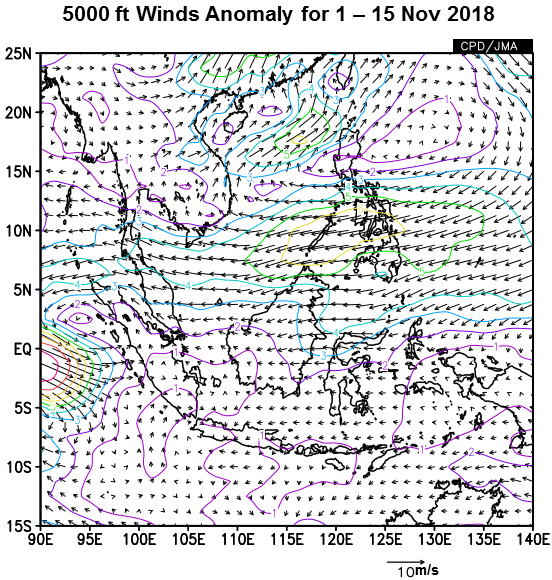 1.4 North-easterly or easterly winds prevailed over the northern ASEAN region, however there were anomalous south-westerly winds over the South China Sea to the northwest of the Philippines with the presence of Tropical Storm Yutu in the surrounding vicinity. 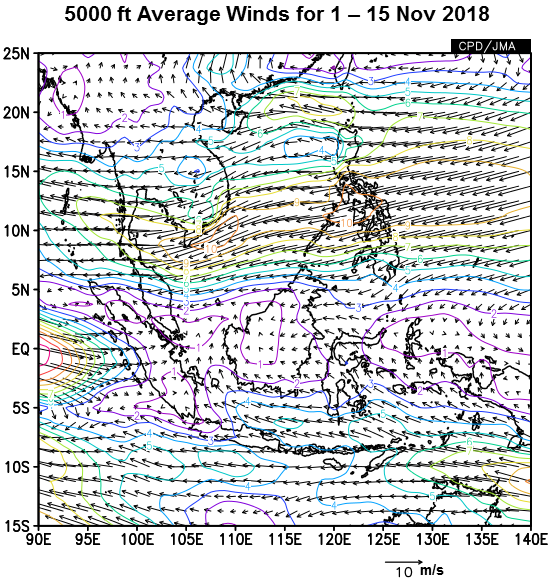 In the southern ASEAN region, Tropical Cyclone Gaja over the Bay of Bengal led to anomalously strong westerly winds over the Indian Ocean to the west of Sumatra, Indonesia, and gave rise to the convergence of winds over the equatorial ASEAN region. 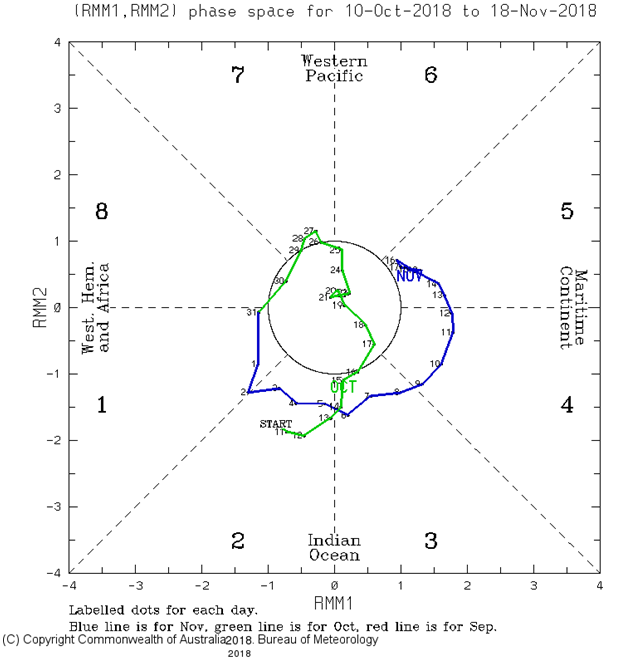 1.5 The Madden – Julian Oscillation (MJO) transitioned from Phase 1 to Phase 5 in the first half of November 2018. The MJO activities contributed to the rainy conditions experienced in the southern ASEAN region. 1.6 The warming of sea surface temperatures in the tropical Pacific Ocean brought near El Niño thresholds to the region. However, the lack of sustained signs of El Niño in the trade winds, cloudiness and the Southern Oscillation Index (SOI) indicates that the tropical ocean and the atmosphere remained uncoupled. Hence, El Niño conditions have yet to be fully established.